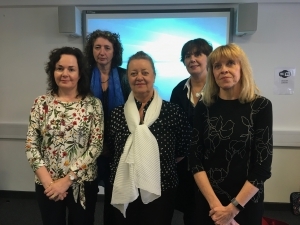 Pictured at a recent information session are Denise Lynd, chair of encompass Digital Business Support Forum (front centre), with Health and Social Care Board staff, Ruth Donaldson, Unscheduled Care and Pat Smyth, Commissioning, back row: Joy Peters and Catriona Rooney, Social Care and Children. The HSC-wide encompass programme, hosted by the Business Service Organisation, is currently in the process of procuring a supplier who will deliver and implement an electronic health and care record across HSC. A new digital record for everyone in Northern Ireland, it will replace, modernise and consolidate many fragmented and isolated systems. It will allow healthcare professionals to access patient information on a range of devices including handhelds such as iPads and mobile phones, wherever they are, safety and securely. Patients will be able to view their own information and communicate electronically with those who provide their care. The system is due to go ‘live’ in summer 2021, starting in the South Eastern Trust before rolling out to the remaining Trusts by the end of 2023. 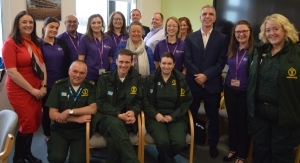 The team has been working to select the right partner to work on this hugely significant programme, while at the same time widening engagement, strengthening the programme team and building collaborative governance structures. • November – over 280 HSC and PPI representatives attended a series of evaluation sessions where four suppliers demonstrated their systems through a variety of scenarios previously developed by HSC staff. As a result, two suppliers were selected and dialogue meetings have been underway since December, with a decision expected on the preferred supplier in May. The selection of the right partner to deliver the digital record across HSC will be supported by a full Business Case. Once approved it will allow a contract to be awarded, followed by the design and delivery phase of the programme. Recruitment and training of more than 200 implementation staff will be required during 2019, with the team due to move into their new Belfast city centre offices later this year.